Koh Tao has some amazing beaches and bays. The waters are crystal clear which make them ideal for swimming and snorkeling. There are so many things to do on Koh Tao compared to the size of the island. 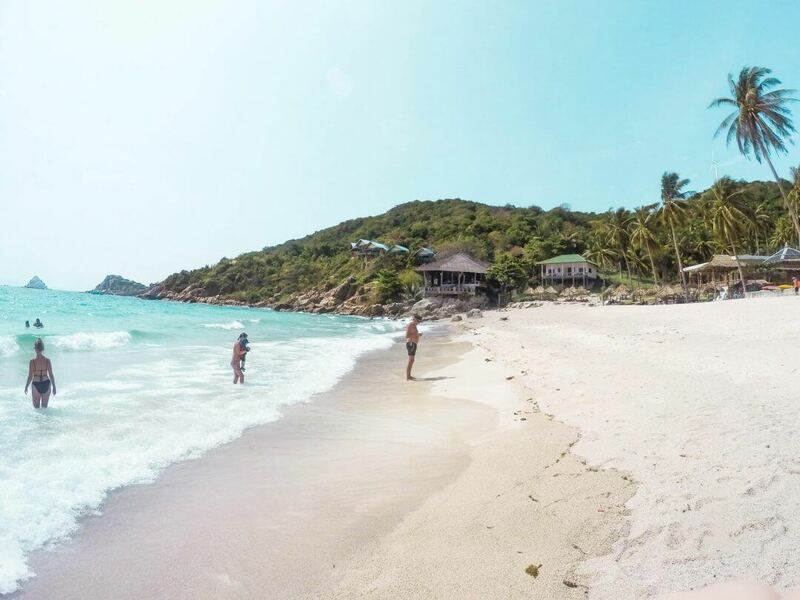 All the Koh Tao beaches have their own pros and cons, use our Koh Tao Beaches list and decide where you like to spend your time on Koh Tao. 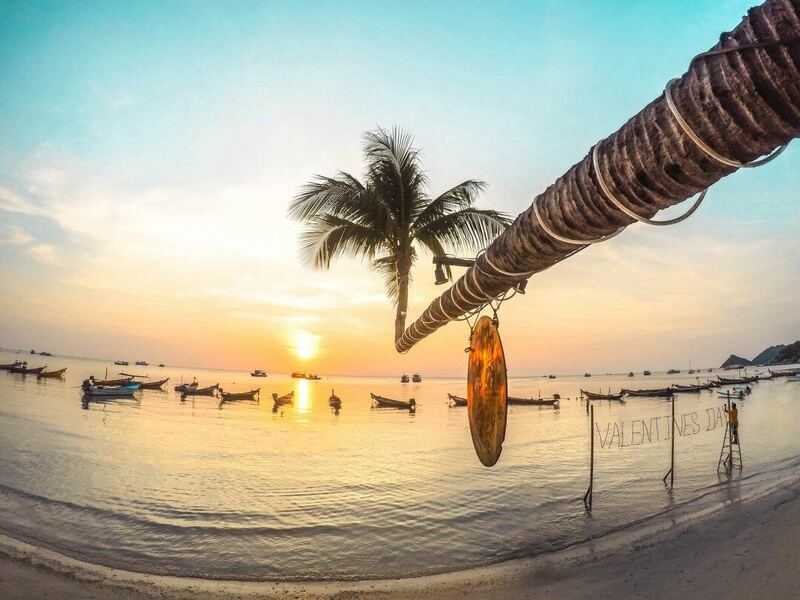 Several beach bars and restaurants are located at this 1.85 km long beach, which makes it the longest on Koh Tao. Probably also the busiest beach one. Still not too busy for the Thailand standards. We had some great sunsets and parties at this beach. You can’t fly to Koh Tao but it’s best to reach by airplane via Bangkok or Koh Samui. This beach is only reachable by foot or water taxi. It has a swing ? and plenty of shade under beautiful coconut palms. There are a couple of bars to grab a drink or snack. This is the third largest Koh Tao beach and it’s located in the South. In this tiny town, you’ll find a 7-Eleven, some dive centers, and restaurants. There is also a turtle conservation program but we weren’t able to find it. One of the Koh Tao beaches that were a little hard to reach. Located at the southern tip of the island. You have to pass Chalok and Taa Toh Resort until the end of the road. Then walk your way down. There are a lot of trees near the beach which gives it a unique beach view and it provides shade when you need it. There’s also a concrete path you can follow that goes around back to Chalok Baan Beach. In the southeastern part of Koh Tao, there’s a beach called Haad Thien, where the coconut palms are lined perfectly. This is a lovely beach to relax. It’s not that quite due to the resort that is located on the beach but that didn’t bother us at the time. The name of the bay is not just a name since you can snorkel with Blacktip Reef sharks and a few huge turtles in there. To see them you need to swim out about 250 meters out of the beach to where it drops down deeper to 3 meters. You also should be able to see them near Sai Daeng Beach. 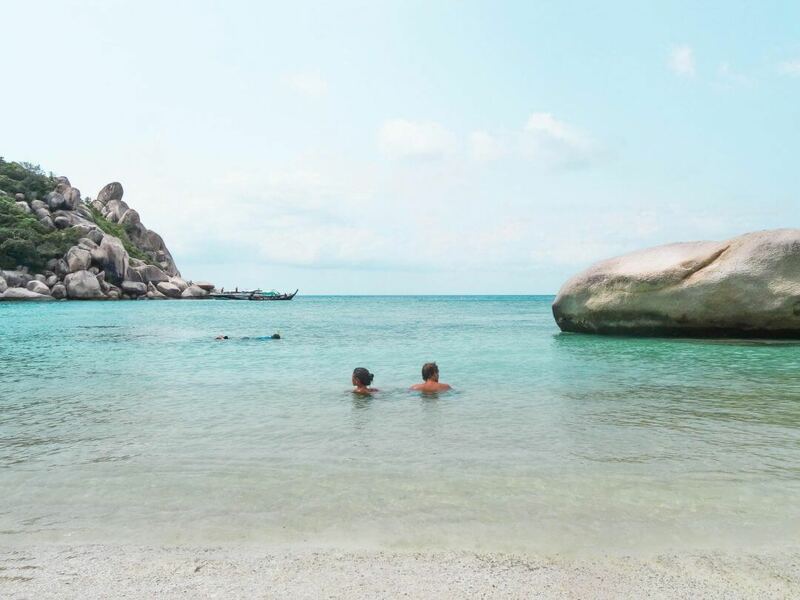 Check the weather in Koh Tao in this post. Aow Leuk is a lot easier to reach. You can take the taxi to here if you’d like to. This beach is private and does not allow you to bring your own food and drinks onto it, although we did bring our food and be sure to take our garbage. The beach closes at 5 pm. Tanote Bay has a beautiful white sand beach with good snorkeling and diving possibilities. The road down to this beach on Koh Tao is crazy steep. There is this enormous rock in the water where you can jump off into the ocean. A very small, rocky, beach were you should come to snorkel. There is a popular spot for rock jumping for 3 to 12 meters. This is also an interesting place for scuba divers since you can swim through underwater tunnels. 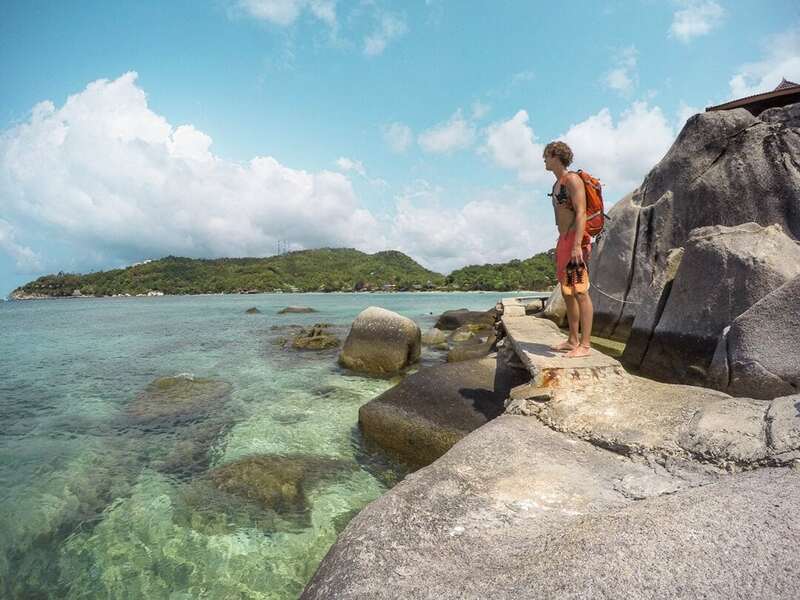 You can only reach Laem Thian by foot, the trail to Aow Mao is known as one of the best hikes on Koh tao. From Tanote, you can kayak to Laem Thian within 30 minutes. You can spend an entire day exploring Hin Wong Bay. Rent a kayak to get around because it’s difficult to walk on the rocks around the bay. The entrance fee for the beach is 50 baht or just buy a drink. This vibe in this area was really laid back. This is one of the busier Koh Tao beaches. Mango bay (Aow Muang) is a large bay with a small beach and a reef. Which is the reason for the neighbors of Koh Samui and Kop Phangan to take a day-trip to this bay. Pay as little as a 100 bath to enjoy the amazing scenery at Mango Bay. This is the first island you’ll see when you Google for Koh Tao Beaches. Multiple times named to be one of the most beautiful islands in the world. You only can reach it by a 10-minute longtail boat ride. This boat leaves from the Mea Haad or Sairee beach. A 100 bath fee will be charged when you enter the island. It’s not allowed to take plastic bottles to the island, which is a good thing. :) Go there early because the island is very popular! The viewpoint from the peak is something you should miss as well. 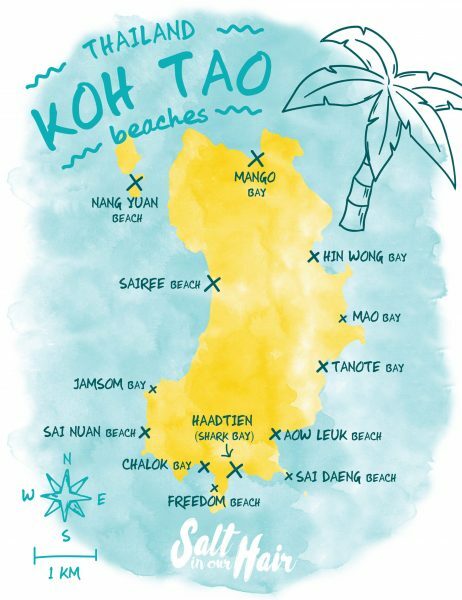 Now you know all the beaches on Koh Tao. Check the best time to visit and the weather on Koh Tao.